The Trygames release is a downloadable release which is now obsolete. Although the direct link to the installer (trial version) is still available, it is no longer supported and will not work with the 3.6+ beta updates and WormNET. People with such version are advised to request a refund through this page. The information below is collected from the trial version of the Trygames release. The Installer is a Wise installer. Most of the audio files in the archive are in .OGG format in order to reduce the installer size. The file /User/Import/logo2.bmp.jp2 is for the same reason. These files are decoded using a special program called "decoder.exe" during installation. The installer logs installation process in a temp file, and later moves to INSTALL.LOG after installation. Extracts the uninstaller "UNWISE32.EXE" from the archive to <APPDIR>\UNWISE.exe ; also makes an entry for Add/Remove programs. Extracts all the files from the archive to <APPDIR>. Launches "decoder.exe -f lfiles.lsy -p" to decode the .OGG sounds and the .JP2 image. Prompts and adds a desktop shortcut to Worms Armageddon. Advises user to install the Beta 2 update if Windows XP/2000 is detected. Clicking "Yes" launches the browser to download the update from Trymedia. Moves the temporary log file to <APPDIR>\INSTALL.LOG . Extract all the files from the archive to <APPDIR>. @="%ProgramFiles%\games\worms armaggedon\WA.exe" ;This is a bug, see below. The installer sometimes prompts the user to restart the computer. The reason for this is unknown. The installer inserts an incorrect path to the registry value that makes the short command "WA.exe" not work. The problem is that an alternative spelling, "armaggedon" has been used instead of "Armageddon" in the path. ↑ By default, the installer chooses "%ProgramFiles%\Team17\Worms Armageddon\" as the installation directory. For the purposes of this article, <APPDIR> refers to the installation directory chosen by the user, as a string. ↑ 2.0 2.1 2.2 This process is not logged into INSTALL.LOG . Beware. ↑ By default the group name is "Team17\Worms Armageddon"
↑ The message is: "The program are you trying to install was not designed for your operating system. The program may not work properly. Press YES if you want to download a patch for Windows XP/2000 or NO to finish the installation process." 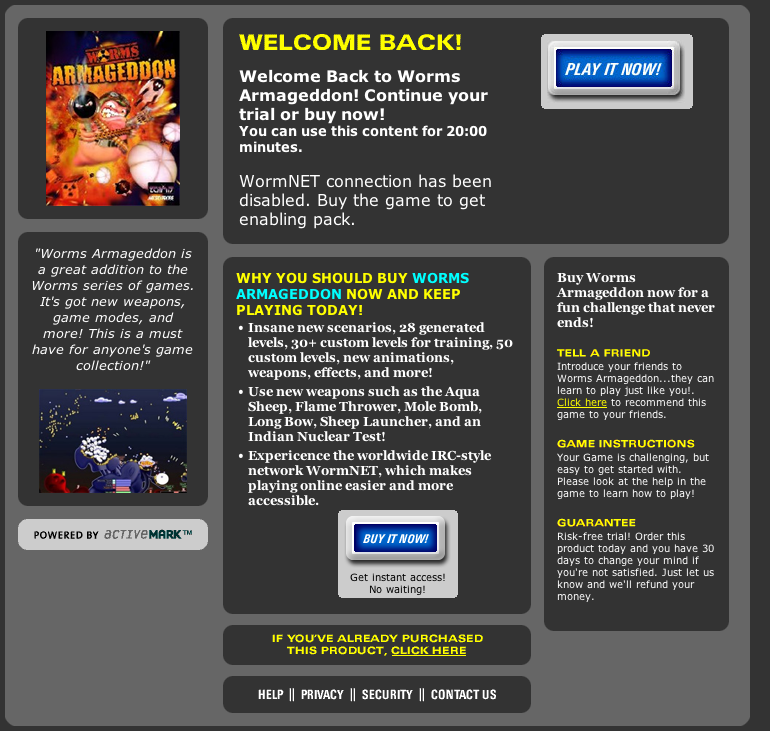 Official webpage of Worms Armageddon Trygames release. Archived from the original on 2007-11-20. This page was last modified on 29 September 2012, at 05:52.